Nottingham Castle – Apart from the historic gatehouse, it’s not a castle like you might imagine a castle to be, but don’t let that put you off! The original was destroyed in the 1600s and sadly many of the Robin Hood connections went with it. Today’s castle is basically Nottingham’s museum, art gallery and tourist attraction rolled into one. Highlights inside include the caves, the art collection, the beautiful gardens and an impressive view over the whole of the south of Nottingham. 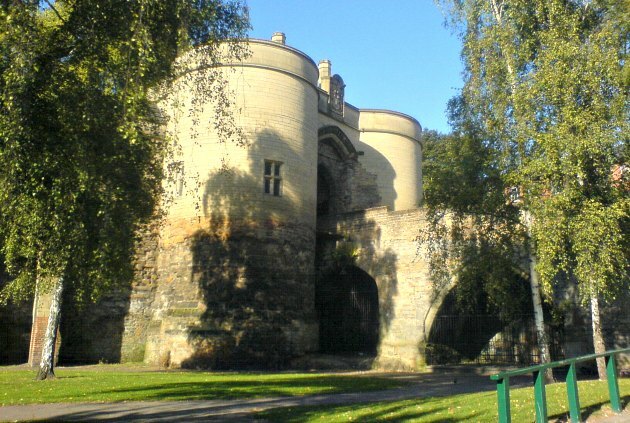 Nottingham Castle is on the outskirts of the city centre near to Maid Marian Way, a short walk from the Old Market Square. 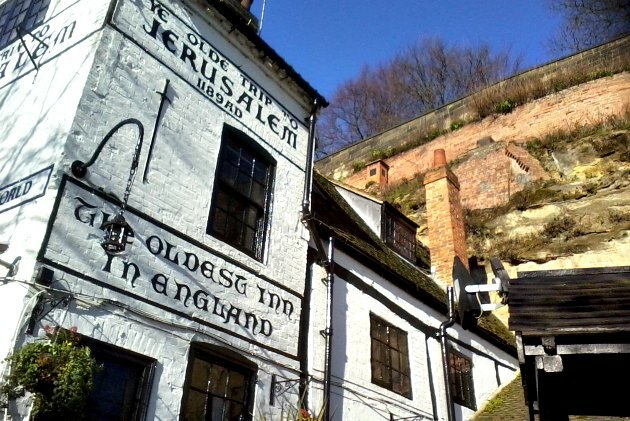 Ye Olde Trip To Jerusalem – It’s Nottingham’s most famous pub and reputedly England’s oldest inn. Continue your journey back in time by stepping inside to see the way it’s carved into the caves. In the summer months you can enjoy some traditional English ale in the beer garden. You’ll find “The Trip” as it’s affectionately known at the foot of the rock below Nottingham Castle. Wollaton Hall and Park – This is one of England’s finest urban parks complete with deer and only a few miles from the city centre of Nottingham. 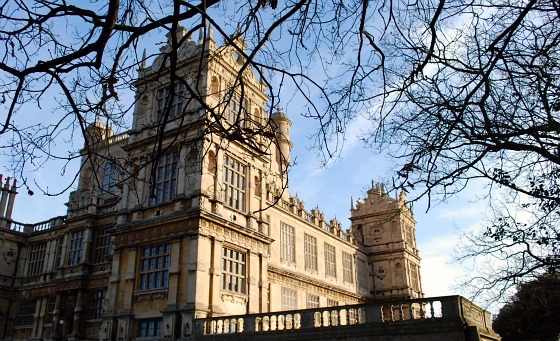 The centrepiece is the spectacular Elizabethan Wollaton Hall which is open to visitors and is free. The hall was used as Wayne Manor in the 2012 Batman movie “The Dark Knight Rises” with Christian Bale in the main role. There are two museums at the hall and on a warm sunny day, there’s nowhere better within the city to while away some time. Make sure you walk around the grounds too as you don’t realise just how vast the park is until you do. Getting to Wollaton Hall & Park will require a bus or taxi journey from the city centre. 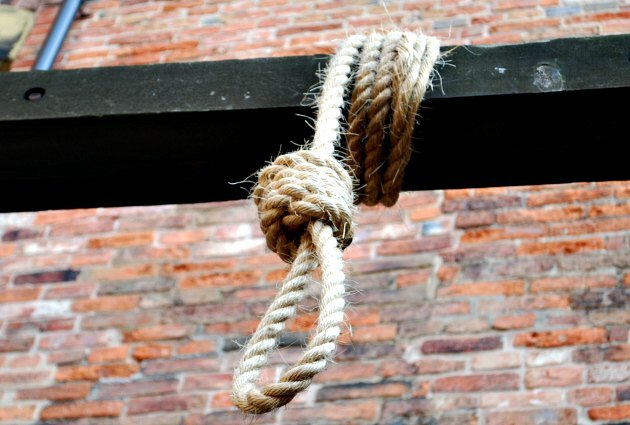 The National Justice Museum – This is so much more than just a museum of crime and punishment as it’s based in the former Nottingham courthouse and county gaol. You will visit the court room and then you follow the steps of condemned men to the former prison cells below. Hangings took place in the rear courtyard which is also on the tour. There are now a variety of historic characters you will meet along the way and a range of exhibitions. They even claim to have a cell where Robin Hood might have been locked up! The museum is in Nottingham’s historic Lace Market (see below) on High Pavement, opposite the Lace Market Hotel. Green’s Windmill – You’ve probably never heard of mathematician George Green, but this is where he grew up. 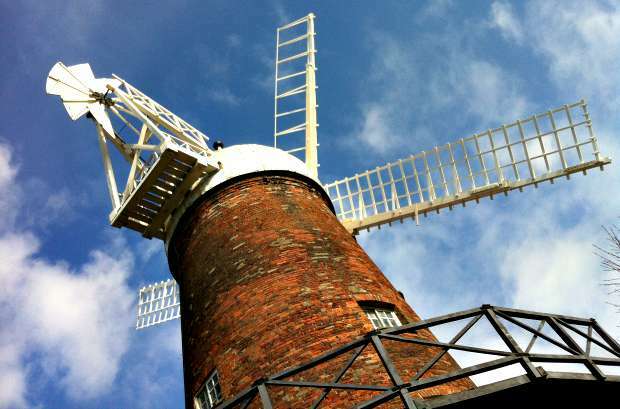 The windmill was built by his father and although destroyed by fire in 1947, it has been restored to a working state. We think it’s a great family attraction and Wednesdays to Sundays you’ll find the sails still turning and milling taking place too. There’s also a science centre at the mill which will tell you more about George Green. Green’s Windmill is in Sneinton which is just about in walking distance from Nottingham city centre. Admission is free. City Of Caves – Nottingham is famous for the number of caves it has, carved from the soft sandstone that the city is built on. 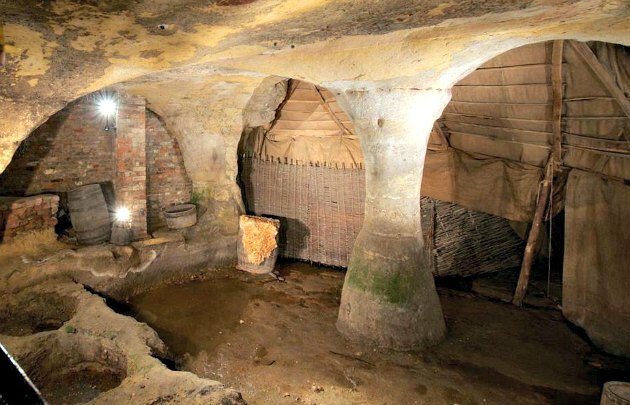 This attraction takes you underneath ground level to see a network of caves and shows you how they were used as dwellings, air raid shelters and even a primitive tannery. The entrance to the City of Caves is in the Broadmarsh shopping centre. 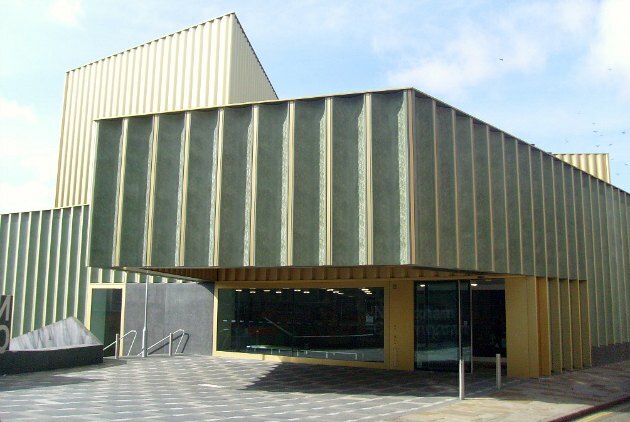 Nottingham Contemporary – This modern art gallery is the newest addition to the Lace Market (built in 2009) and the building’s design is both striking and controversial. Whatever you make of the outside, it’s definitely worth a trip inside where the gallery boasts international modern art for free. It has a number of exhibiting spaces and a nice cafe bar on the lower level. Nottingham Contemporary is at Weekday Cross (Lace Market tram stop). 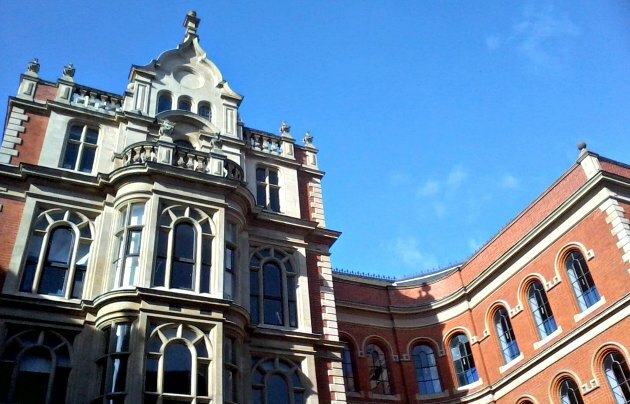 The Lace Market – This area of Nottingham city centre is jam packed full of historic buildings with the beautiful St Mary’s Church as its centre piece. Parts of the church date back to the 1400s and it is open to visitors. Although the area surrounding the church dates back to Saxon times, the current buildings were part of the explosion in the lace industry in the 1800s. Nottingham became famous for its lace and at its height, this area had 130 factories making it. The Lace Market is signed from the shopping centres and has its own tram stop. National Ice Centre – Nottingham is the home of the world famous ice dancers Torvill and Dean and they began skating on this site. The National Ice Centre is an impressive shiny replacement for the tired old rink that used to be here though. 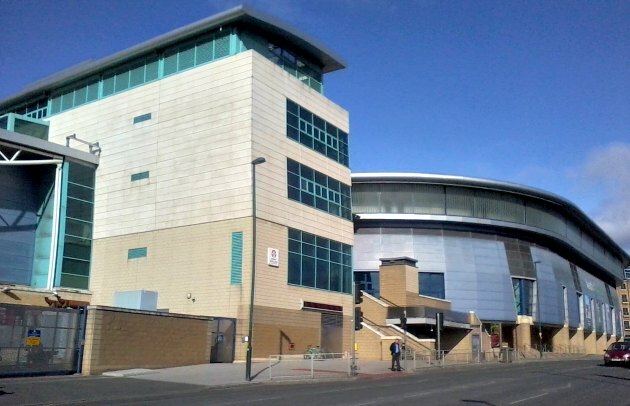 It has two Olympic sized rinks inside, one for public skating and one known as the arena which is used for shows, concerts and Nottingham Panthers Ice Hockey games. Skating sessions are available daily to the public and whilst you’re in Nottingham check out what shows are on here too as it’s not unusual to find international music stars holding their concerts. The National Ice Centre is on Lower Parliament Street at the edge of the Lace Market. 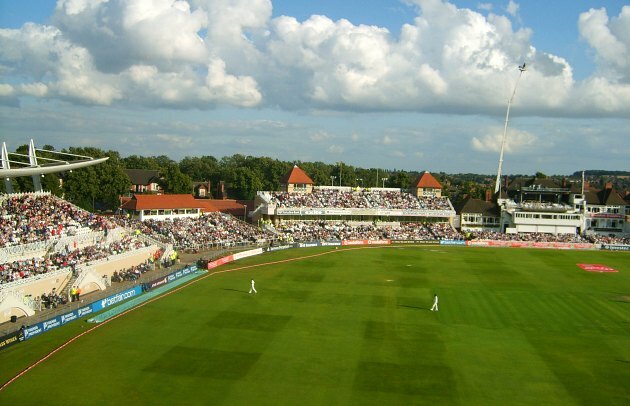 Trent Bridge – This is one of the world’s most famous test cricket grounds and is the home of Nottinghamshire County Cricket Club. The ground has seen considerable development in recent years, but still has its historic pavilion. Tours of the ground are available every Tuesday afternoon. However, we’d also suggest that you consider buying tickets for a game here. Trent Bridge is on the A60 just over the river and is around a 25 minute walk from the city centre. Regular bus services are available too. The Council House – In the centre of the city in the Old Market Square stands Nottingham’s Council House. This building is the home of civic events in the city and although it was built in tough economic times (1929), no expense was spared in its detail and opulence. The impressive dome stands 200 feet above the ground and houses “Little John” – the very deep sounding clock bell. Inside the council house you’ll see the beautiful ballroom, the council chamber, the Sheriff of Nottingham’s rooms and the Lord Mayor’s parlour. 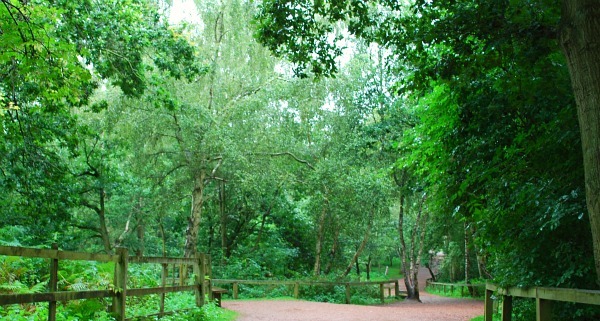 Sherwood Forest – It’s Robin Hood’s home, but sadly there’s not much of it left! Most visitors head to the village of Edwinstowe which is around 20 miles from Nottingham where you’ll find themed shops and the Sherwood Forest Visitor’s centre. The 450 acre Sherwood Forest Nature Reserve contains the most famous tree in the forest, the 800 year old Major Oak, which is propped up with scaffolding. It’s within walking distance from the Visitor’s Centre. The Visitor’s Centre and the forest are free to visit but there is a small charge for parking. 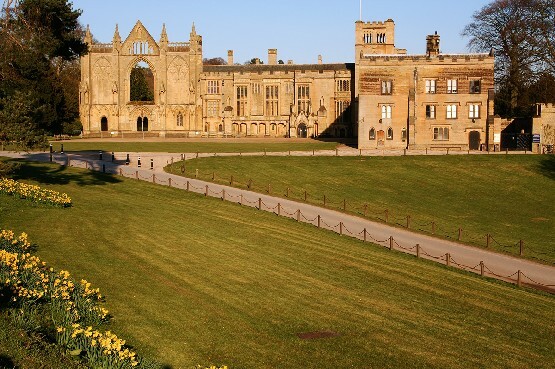 Newstead Abbey – This is the ancestral home of the poet Lord Byron and is 12 miles north of Nottingham on the A60. If you’re coming to Nottinghamshire we think visiting the Abbey is an absolute must. The house and gardens are beautiful and to this day the house retains its medieval character. The house and gardens are open all year round. 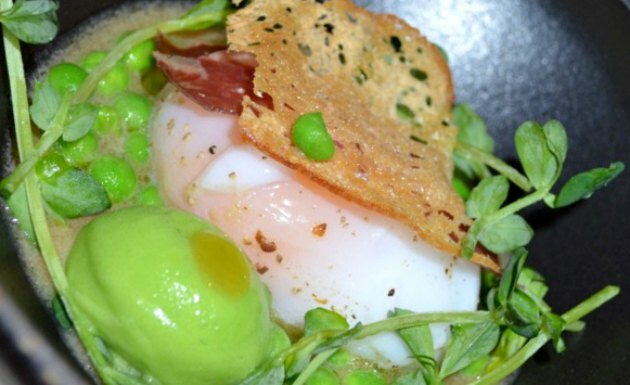 Restaurant Sat Bains – Nottingham is home to one of the country’s best restaurants and if you have the time (and the money) then it’s definitely worth a visit to sample the 2 Michelin Star food. The restaurant is set in an old farm near the boots factory site and has set ‘taster’ menus of several courses. We enjoyed the food immensely and we’d recommend going for the bigger menu as even if you choose the smaller one, you’re likely to but extra courses anyway. 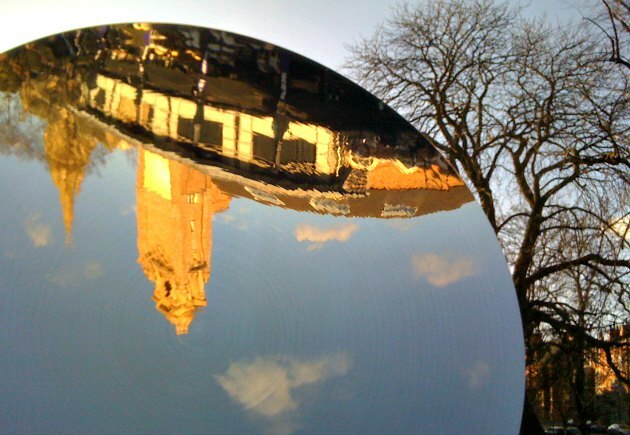 Sky Mirror – This public sculpture by well-know artist Anish Kapoor is outside Nottingham Playhouse, just off Maid Marian Way. A huge reflective dish basically mirrors everything around. It’s been so popular that the idea has been repeated elsewhere around the world including St Petersburg, Russia and at the Rockefeller Centre in New York. Nottingham has a good public transport system combining busses, trains and trams. Most visitor attractions are within walking distance, and public transport is available for the ones that aren’t. For convenience though, we think that for trips to Sherwood Forest and Newstead Abbey you would need a car. 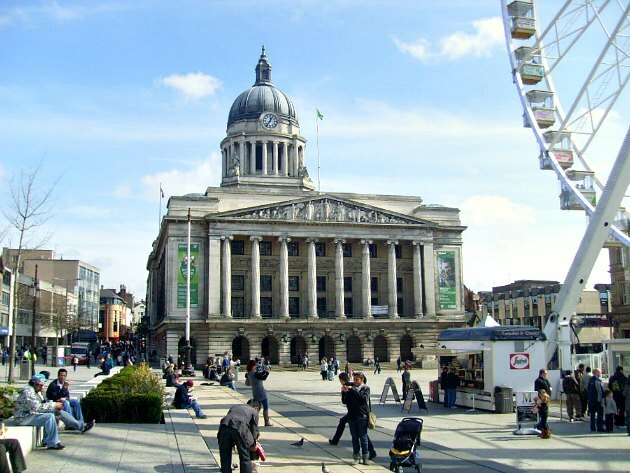 The nearest airport is East Midlands Airport which has regular busses to Nottingham city centre. 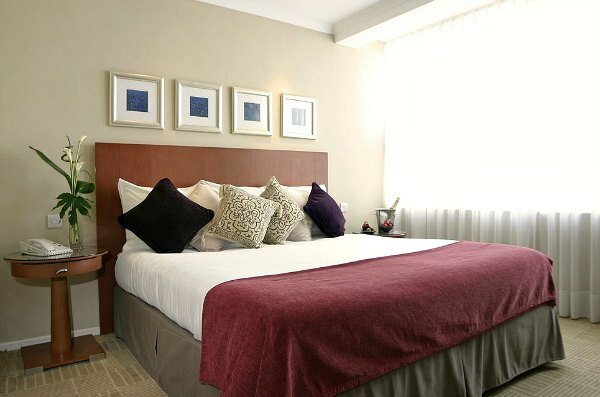 We stayed at the Park Plaza Nottingham on Maid Marian Way and thought the rooms were tasteful, modern, clean and comfortable. It might not be the most attractive building on the outside but the inside is lovely and the location right in the city centre is great, with all the sights of Nottingham in easy reach.